The Drumheller lodge of the Benevolent and Protective Order of Elks has been part of the community for almost 90 years. The origins of the order date back to 1868 in New York and quickly spread across the United States. In Canada the first lodge was established in 1912 in Vancouver, B.C. However, the Elks of Canada are not directly affiliated with the lodges in the United States. The Elks gradually spread across Canada and on December 1921 Lodge 54, Drumheller, was founded. There were 125 charter members including Exalted Ruler L.G. Caswell, Secretary Jim de Zeeuw, manager of the Napier Theatre, and Lee Drumheller, son of Samuel Drumheller. Meetings were initially held in the basement of the Napier Theatre until 1928. During that time the Drumheller Elks held band concerts featuring the Drumheller Elks Band and occasionally other acts. The concerts provided entertainment to residents and money to help families in need. In 1928 construction on the Elks Hall was completed immediately to the north of the Napier Theatre. Today the hall stands empty, but the front façade still faintly shows the colours of the Elks. The building also changed hands during the Great Depression. After the Drumheller Elks could no longer pay for the building, Jim Norstrant, charter member, bought the Elks Hall. 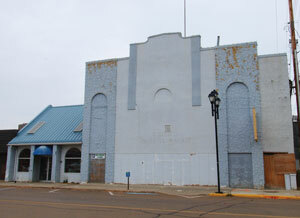 When the Drumheller Elks recovered financially, Norstrant sold the building back for sale price. For years the Elks Hall was a hub of community events. The main floor had a spacious dance hall, and the basement had club rooms and, until 1954, a bowling alley. “I can remember when I was a kid there was always a Saturday night dance in the Elks Hall with local bands,” said Manley Thomson, Exalted Ruler of the Drumheller Elks. Over the years the Drumheller Elks have continued to be active in the community through a wide variety of events such as hosting carnivals, banquets, and dinner theatres. 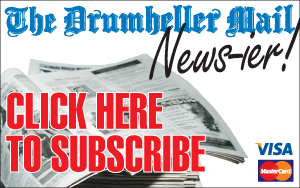 Presently, the Drumheller Elks host bingo every Thursday, and their breakfast on the first Sunday of the month. Although they had a prominent role in the social life of the community, the focus of the Elks has always been that of charity. The lodge has continued to raise funds to help the hospital purchase equipment and medical care for local children. The valley bus receives donations from the Elks, last year being approximately $10,000. The Elks volunteer for the Terry Fox Run, providing drinks and hot dogs to participants. The lodge also donates funds to the national Elks and Royal Purple Fund for Children which focuses on meeting needs of children prior to their 19th birthday and addressing the needs of children with hearing and speech disorders. The Drumheller Elks have participated in builds with Habitat for Humanity in Red Deer and, as part of the Elks of Canada 100th anniversary, will volunteer building in Three Hills. As part of the Elks of Canada 100th anniversary the Drumheller Elks will be hosting the Alberta conference of Elks in June 2012. On December 3, 2011, the Drumheller Elks will be celebrating their 90th year of Elkdom in the Drumheller Valley and have continued to proudly serve Drumheller. The Red Deer River, which flows from the Rocky Mountains east through the Drumheller Valley, is perhaps one of the most important features of the valley. During the early part of the 20th century settlers relied upon the river to provide them and their livestock with water and transportation. However, crossing the river could be a major obstacle. Inhabitants of the area had to rely first on fords to cross the river, which could be hazardous, especially when the river was in flood. To make the dangerous task of crossing the river easier, settlers began to make homemade rafts and ferries and operate them privately. “There were hundreds of ferries all over the prairies,” said Danis. There were at least nine major ferries that operated at one time or another throughout the valley. The ferries were primarily used to transport people, vehicles, and livestock to the other side of the river. However, the ferries also served a valuable function as a social hub where members of the community would congregate. The earliest ferries were operated by a large wheel which passengers would “turn and tell stories while going across,” said Danis. The Alberta government ran the ferries, but commissioned local farmers to operate them in their stead. The Wigmore family operated a homemade ferry between the Kneehill and Ghost Pine creeks until 1908, when the ferry collapsed and Bob Wigmore drowned. 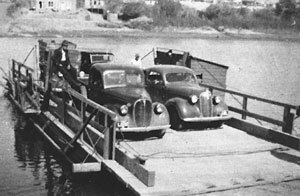 A cable ferry was installed by the government in the same location and was operated by Bob’s father, Sam Wigmore, and John Moyer. Other ferries were operated by the Russel family in Nacmine, and the Greentrees and Leonhardts in Drumheller. West of Morrin, Rosedale, Cambria, and East Coulee also boasted ferries. The Bleriot Ferry, west of Drumheller, has remained in operation for over a century. Andre Bleriot, brother to aviator Louis Bleriot who became famous for being the first to fly over the English channel, was the first operator of what was then known as the Munson ferry. The Bleriot Ferry is one of only seven ferries operational in Alberta today and serves as one of the tourist attractions in the Drumheller valley. It is estimated that ninety per cent of the traffic is comprised of tourists. Other than the Bleriot Ferry there is also the Finnegan Ferry, southeast of Drumheller on highway 862. Like the Bleriot Ferry, the Finnegan Ferry is a tourist attraction, but still used substantially for local transportation. Residents of the Drumheller valley rely on the bridges that have replaced the ferries that populated the Red Deer River. However, in the absence of convenience, it was the ferries that nurtured the growth of the Drumheller Valley. The remaining ferries remind us of this historic legacy. For an evening out, residents of Drumheller and the surrounding areas can go downtown to take in a movie at the historic Napier Theatre. With its single screen, theatre style seating, vintage movie posters, and historic snapshots, the Napier stands apart from the multiplexes and their stadium style seating, and generic decor. The Napier Theatre is not just a place to spend an evening watching the latest films, it’s a part of the history of Drumheller. Garnett Napier Coyle, the namesake of the theatre, arrived in Drumheller in about 1910 where he invested in local business such as the Newcastle Collieries and the Regent and Napier Theatres. The original Napier Theatre opened on Friday September 19, 1919, in aid of the Great War Veterans Memorial Hall. On opening night, the Napier showed the silent film Whispering Chorus, directed by Cecil B. DeMille. Other acts included a vaudeville act, an impersonator, William Guterson, aka Bapco Bill the Lightning Artist, who impressed the audience with his quick sketches, a wrestling bout, a production of If England Dies Tonight with a symphony orchestra, and a performance by Winifred Haliday, a Calgary born, California educated dancer. The theatre operated for the next 42 years under the ownership of Garnett Napier Coyle, who resided in Montreal most of the year. Jim de Zeeuw was made manager of the theatre until his death in 1946. Marguerite Playle, who started at the Napier when she was 16, took over management of the theatre afterwards. During that time the theatre continued to show films alongside live performances. 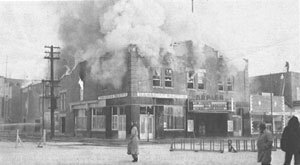 On December 5, 1951 tragedy struck the original Napier Theatre as a fire engulfed the cinema. A full fire fighting brigade battled the blaze during the night. In the end the blaze claimed the Napier Theatre and fire fighter Adolph Guterson, son of the Fire Chief William Guterson. The Napier did not give up, however. Even though the Napier itself was demolished, Marguerite Playle, manager of the theatre, moved the operation to the Legion Hall and was showing Stars in my Crown, and bookings for live performances continued. The Napier Theatre was rebuilt in the same location and reopened in 1953, showing of River of No Return, starring Robert Mitchum and Marilyn Monroe. Garnett Napier Coyle passed away in 1961 in Quebec, but the Napier Theatre continued and was bought by Bob Shapiro in 1968, who operated the Sky-Lite Drive-In Theatre that operated in Drumheller from 1953 to 1973. After Bob Shapiro passed away in 1974, ownership passed to his son Lorne. In 1985, Lorne sold the Napier Theatre to Landmark Cinemas of Alberta. Current owners Jeff and Kathy Larson then bought the theatre in 1996, and renovated much of the theatre and sold it to Keith Barnard in 1999. Ownership passed back to Jeff and Kathy in 2005. Today, the Napier Theatre is continuing the role it has held for nearly a century providing entertainment for the community. While you might not be able to catch a live wrestling match or a lightning quick sketch artist performing on stage, that history pervades the Napier Theatre, and cannot be found in any multiplex.